Hello October! 3 more months and it is going to be the start of yet another new year. I am appalled at how time really flies. It is hard to digest that 3/4 of the year have already left us. I think this year I was definitely more focused on work and I hope in 2019 it would be even better. Sure, I know there will be challenges and not every day will go exactly how I would want it to be, but I hope that with more focus and dedication, I can live even more of the life I want. Anyways, I have not eaten salmon for quite some time. I know I skip topics very abruptly. This is something that happens in my daily life too and not just on MK. 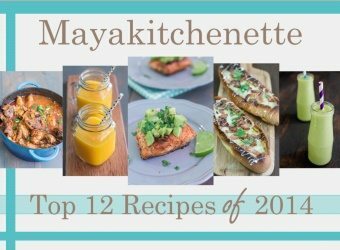 When it comes to cooking salmon, there are quite a number of ways you can do it to get some added protein and good fats to your diet. I personally love to pan fry it. My mom kind of stopped eating salmon and I do not fancy cooking something that she does not eat. Like I loveeeeee Pasta but since my mom is not a huge fan, I do not cook it regularly. I would wait for a cousin or my brother to come over before cooking pasta so that I have someone to share the pasta with. For the past 2 weeks, I have been thinking of salmon for quite a bit and finally, I got down to cooking it. 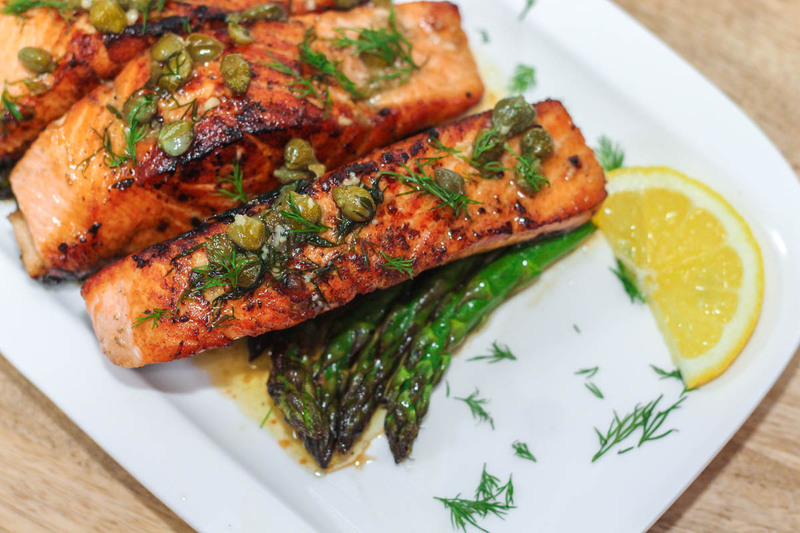 I have always been a fan of capers so it was a no-brainer to make this quick lemon caper butter to drizzle over the top of the salmon. The lemon caper butter is obviously everything. Garlicky, buttery, lemony and totally mouth-watering with just the right amount of brininess from the capers. I pan fried my salmon fillets as I wanted it to be slightly crisp on the outside. It was still moist and flaky on the inside though. If you do not want to pan fry your salmon, feel free to grill it in the oven. It would be good to sear the top of the salmon over medium heat in a frying pan for a bit before grilling it. I had to serve some vegetables along with the salmon. Yes, pink is pretty but we need our greens too. I grilled some asparagus with a little bit of olive oil, garlic salt and black pepper. Simple but oh ‘so perfect with the Salmon and Lemon Caper Butter. I got my mom to have some of the salmon and she was like “I don’t feel like eating salmon. I’m going to have eggs instead.” I was like “Okay maybe just have a bite and see if you like it? If you don’t enjoy it, I will finish it.” Well, let’s just say she devoured her portion and didn’t need my help at all. For someone with a finical palate, this speaks volume. It is like Gordon Ramsay giving you a big nod in affirmation. 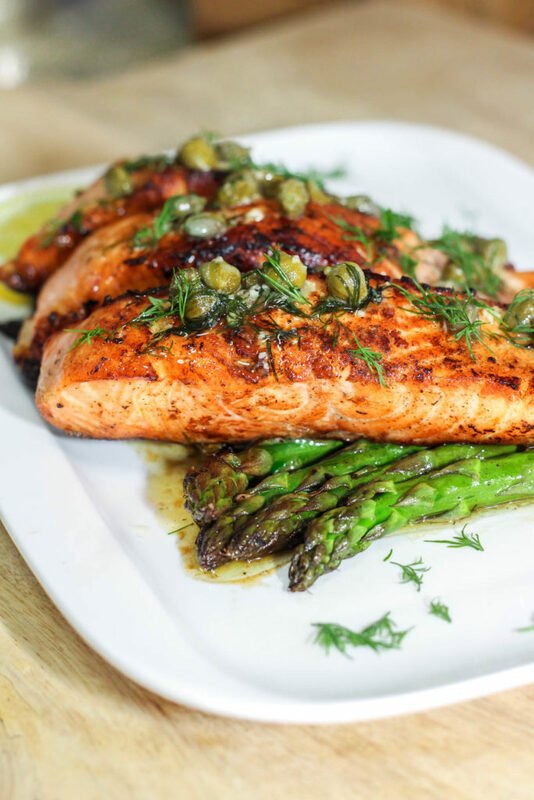 This Salmon with Lemon Caper Butter is decadent and makes such an easy family dinner. I can assure you that this is going to be a favorite in your home. Pinkie salmon promise. Season the salmon fillets with the lemon juice, herb seasoning, black pepper and garlic salt. 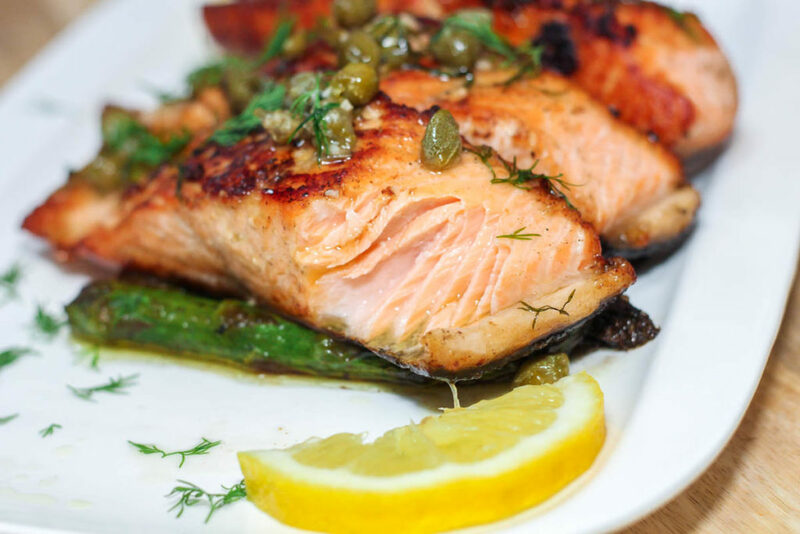 Heat a pan with 1 tbsp of olive oil and fry the salmon for 4-6 minutes on each side, depending on how well done you like your salmon to be. In another frying pan, add oil, butter and garlic. Cook for 30 seconds. Add capers lemon zest and lemon juice. Season with salt. Stir till it forms a creamy mixture. Remove from the flame and add dill. Spoon sauce over the fish, garnish with more dill and serve.